Wednesday was the annual SWAT Qualification Day and I made time to attend. Although I am retired from the Team, they graciously let me join them. After the physical requirements and marksmanship quals were completed, we had additional ammunition for shooting drills. The 100-yard range was open and a few of the guys were testing out some pricey long guns brought by a SWAT medic. These included an FN SCAR and an FN FS2000. While the shooters hammered away at distant silhouette paper targets, I decided to give them some friendly competition–with my handgun. On an adjacent shooting bench, I ceremoniously unlimbered my Sig P226 and rested it on a sandbag. Its iron sights mocking the other guns’ rifle scopes, my pistol began surveying a blue B-21E downrange. One of the mutts commented, “…Detective Bureau sniper?” There was snickering. I thumbed back the hammer spur on my Sig to get the first round off in single action. 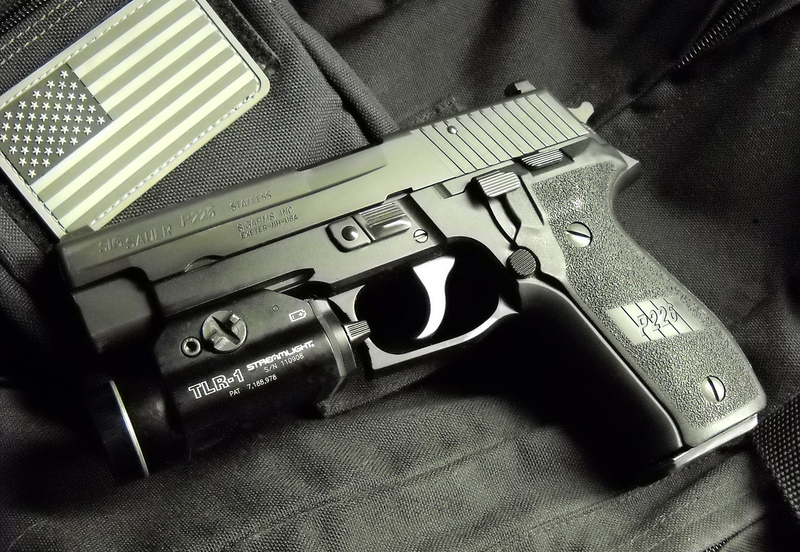 This particular P226 was an older model with bar and dot sights. I carefully lined them up on the tiny man-shape a football field away. Bullet drop for the Speer Gold Dot .40 S&W 165 grain at 100 yards is about 8 3/4 inches, according to the manufacturer. Looking across the top of the slide, my sight blade comically looked to be the width of the shoulders of the target. I held high, with the neck and head of the bad guy sitting atop the front dot. Deep breath let half out and a steady rearward trigger squeeze resulted in the pistol’s first “surprise bang.” I let the trigger forward just to where it reset with a click, then repeated the firing drill nine more times before they called the line cold. Unbeknownst to the Sig and me, our target on Lane 17 had a passel of 9mm holes from the previous MP-5 exercises. Ugh. A buddy and I combed over the damage. We found one very probable and four confirmed center of mass .40 caliber hits in a generous group. The rest may well have been there, hidden in the tattered paper. Five of 10? I will happily take that. I can’t remember the last time I shot a sidearm at something that was over 25 yards away. My bad. In 2014, Aaron and I wrote about two long-range police shootings. It should not have taken me 10 months to fire some rounds at distance. I wish I could have sent more, but the Team moved to CQB right after my abbreviated string. Ten practice shots are in no way adequate training, but they are better than not having seen where the bullets might impact. I hope you are able to get some handgun time beyond your comfort zone. Could be handy some day. Top photo: I took it at 50 yards, so you can imagine the targets are much smaller at 100. This entry was posted in Firearms, SWAT and tagged police handguns, police training. Bookmark the permalink. Love it Randall teaching the young guns new tricks, been there and I think this is awesome! Thank you, Chris! Florida de-emphasized greater shooting distances when it dropped the 25 yard shots from state qualifications. We are just not training gunfighters and that can jeaprodize lives when it hits the fan. I remember reading a long time ago (probably in the old Police Marksman magazine) that when Florida’s POST mandated 50-yard shooting in the 70s, it was opposed by the Florida Dept. of Corrections (because they shot with rifles from towers and 50 yards was too close) and the Miami PD (because Miami is a congested, crowded city and no MPD copper would have a clear 50-yard shot; in fact, a copper who took a 50-yard shot would probably be disciplined). The Border Patrol, when it was semi-autonomous, included 50-yard handgun shooting, because of the open desert environment where most BPAs worked. 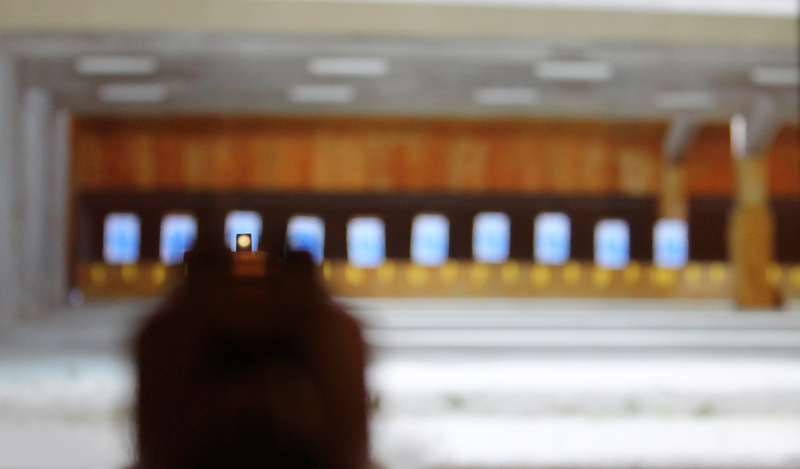 I always thought that shooting at reasonable longer ranges should be included in training, if not in qualification. How far is it from the front of a supermarket to the back? From one side of a street to another? If not 50 yards, then certainly more than 15 or 25. You should never ignore a chance to be more effective in an emergency. Sadly, I am not king. Old 1811 for King! Huzzah!